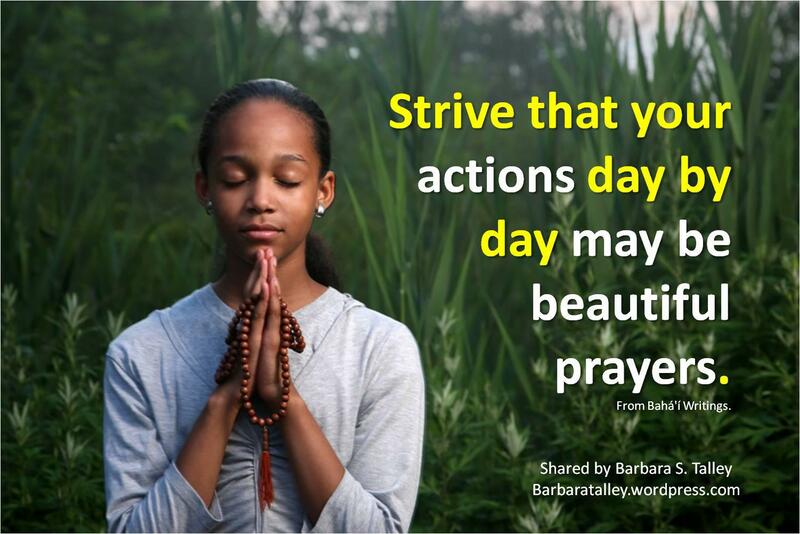 Strive that your actions day by day may be beautiful prayers. We are what we think, feel, talk about, and DO every day. The sum of our actions determine our character and highlight what is valuable to us. Most people say that their spiritual life (worship) is the most important part of their existence. But, what does worship really mean to you? Is it something you do on a specific day of the week or is it a part of your daily habit or lifestyle? To be truly effective, worship has to become a daily habit or a way of life that arises from our deep desire to love and serve our Creator. And be clear, the Most Great Spirit does not need us; we need that abundant grace. We show our gratitude for life and the ceaseless blessings bestowed upon us by habitually serving humanity. Each of us must extend the love, grace, forgiveness, generosity, patience, encouragement, and justice to others that we want for ourselves. What we send out, we bring about. And this way of life has to become a habit. It should not be something we only do on a specific day and time that is limited to only certain people or under certain conditions. We must each strive to live in such a way that every moment of our lives is lived like beautiful prayers. ← You Hit the Creation JackPot!! !